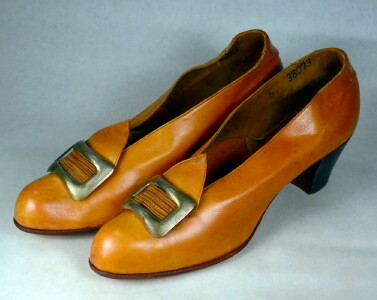 1910's vintage tailored afternoon pumps. Golden kid leather. Closed bump toe. Sculpted point tongue with silver metal buckle and corded ribbon backing. Closed shank & quarter. Stacked leather Cuban heel. Brown leather liners. EXCELLENT condition considering age. Show moderate wear to soles. Slight wear & hand writing at linings.